Several beaders have a difficult time learning how to bead slip-stitch crochet tubes. This pattern helps the beginner learn how to start the tube. Additionally, doing an invisible join presents another hurdle that discourages trying to learn. This pattern also gives step-by-step directions for finishing a tube with beadcaps. A rudimentary knowledge of simple wire-wrapping techniques, such as making a simple loop, and a wrapped loop are necessary, as well as an understanding of simple crochet techniques, such as starting a slip-stitch chain and joining it into a round. However, successfully using these bead crochet tubes for bracelets, necklace, earrings, and pull tabs is within reach by following the instructions and the numerous pictures of the steps to take. The picture is of an example of one possibility using these techniques. 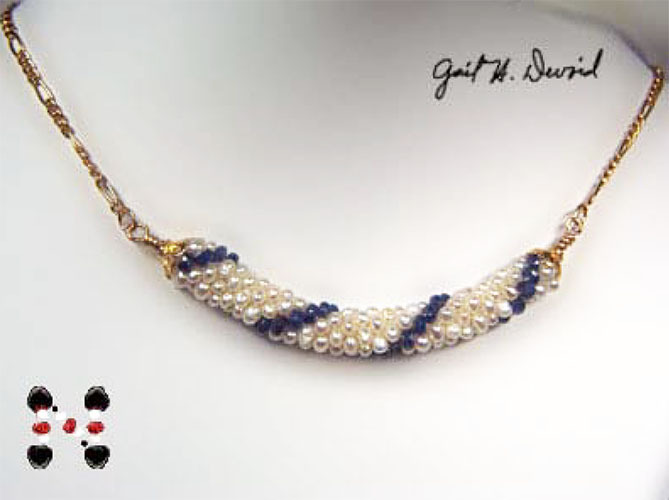 The pattern does not include instructions for making the necklace, only the techniques for starting and finishing a bead crochet tube with beadcaps. You can lengthen or shorten the piece by increasing or decreasing the materials used.